As with the campaign, all of the extra modes can be played in co-op. We’ve written about the co-op in the New Super Mario Bros. series twice before, and for the most part, it’s identical to what came with New Super Mario Bros. Wii. Up to four players can play at the same time, hopping and bopping their way through the Mushroom Kingdom. As with NSMBWii, this mode can be chaotic. The camera will follow the player in the “lead”, which leads to some untimely deaths for your slower co-op partners. Unlike its predecessors, I didn’t find it to be quite as frustrating, and New Super Mario Bros. U adds a new twist which ends up being pretty neat. The twist is that a fifth player can take the WiiU GamePad and provide support via “Boost Mode”. The player in Boost Mode is able to assist the other four players in a variety of ways - tapping on the play field creates extra platforms, which can create new paths to Star Coins, or even catch a player who is about to fall to their doom. You can also tap on enemies to momentarily stun them, knock Koopa Troopas into their shells, or even deflect projectiles. 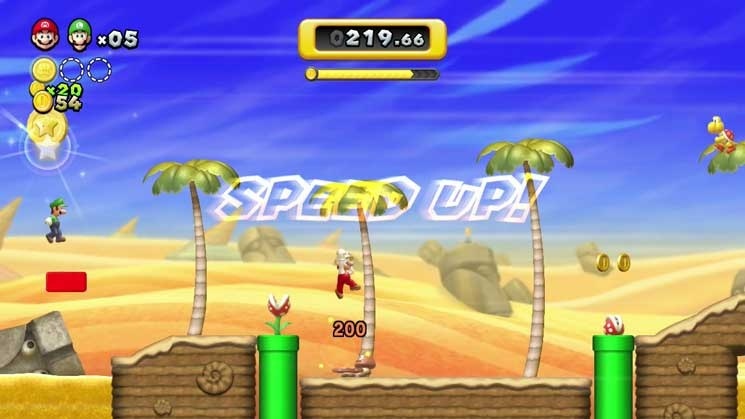 If players jump on enough Boost-created platforms in a row, a meter will fill up, allowing the player using the GamePad to tap on enemies to destroy them. One of these days, Nintendo will release a co-op Mario game that delivers on all of the potential inherent in the idea. For now, New Super Mario Bros. U is about as close as they’ve come. Boasting the best 2D Mario action since the SNES days, shiny new HD graphics, and a fun & challenging set of levels to play through, this is an easy recommendation. The Co-Op Experience: Team up with four friends through the game. A fifth player can use the WiiU GamePad to assist the other four players by creating extra platforms and disrupting enemies. Page created in 0.5965 seconds.